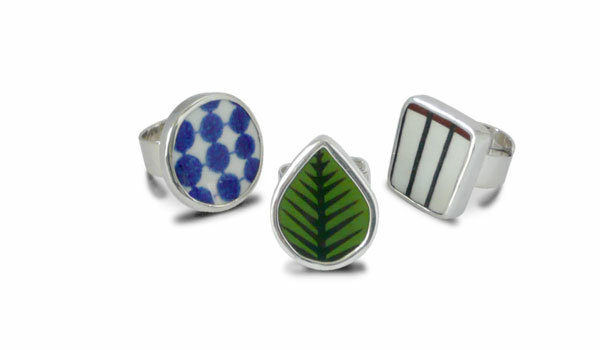 Rings made from recycled S. Lindberg porcelain. Materials: Fine bone china and silver. Ring size: Adjustable to fit all. Height: ca. 25 mm. The porcelain has been carefully cut by hand from a vintage plate and then the cut piece has been framed with silver. The ring has an adjustable size and the 9 mm wide band overlap for a perfect fit on every finger. Each piece is unique so please allow for variations. Re-cycling at it’s best!